My work as a photographer often takes me to the world’s most beautiful places. I’ve been fortunate to see incredible works created by human hands and breathtaking wonders created by nature, and occasionally I’ve visited locations made beautiful by their history — sometimes a noble history and sometimes a tragic one. All of these places, in their own ways, are dear to me. September 2017, panorama from 4 vertical images, additional exposures for highlights, focal length 16mm, aperture f/11, shutter speed 0.5 seconds, ISO 64, tripod. But sometimes the world surprises me. Sometimes I find myself deeply moved by the simplest of things. Sometimes my travels lead me to places that manage to capture the spirit of a people in a simple and endearing way. Copenhagen was one of those places. Danes are consistently ranked among the world’s happiest people. It’s true that Denmark is an affluent country and the government offers more social protections than many other countries. But the Danes seem to have a sort of inborn happiness, a lighthearted, easy approach to life that inures them to the stresses of life. It’s difficult not to be envious of their relaxed take on life. Walking the streets of Copenhagen — which can indeed become congested and busy, like any other large city — I still felt that life somehow moved more slowly and deliberately there. The Danes’ lighthearted approach to life agreed with me. And as I walked, I eventually made my way to Amagertorv Square, the city’s central square, as well as one of its oldest. 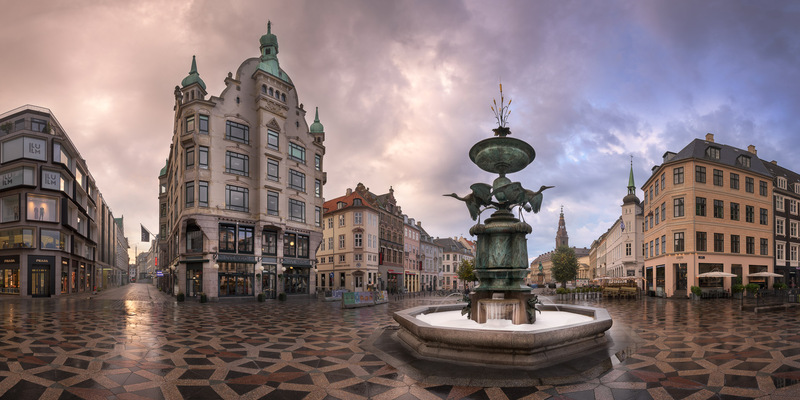 The centerpiece of Amagertorv is the Stork Fountain. Created in 1894, the fountain honored the silver wedding anniversary of Crown Prince Frederik and Crown Princess Louise. Over the years, it became a tradition that newly graduated midwives gather and dance around the fountain. I don’t know the significance of the storks, if there is any. But I found the fountain charming, whatever its meaning. The idea that the Crown Prince and Princess would be honored through three storks poised to take flight seemed to me to be emblematic of the Danes and their slightly quirky, carefree take on life. And the image of young midwives dancing around the birds which, in myth, deliver their young charges, made me smile to myself as I setup my tripod. Denmark may or may not be the happiest place in the world, but on an early morning in Copenhagen, as I prepared to photograph three bronze storks, I felt quite content.